Features: At Crazy4clipons, you have to expect the unexpected! I love designing with textures and combining items that are not supposed to go together. 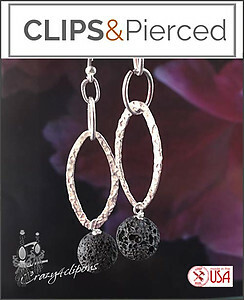 In this case lovely hammered oval sterling silver is paired with a beautiful round lava stone bead. The shine of the silver makes the black lava "Pop" and the roughness of both texture compliment each other very nicely. These earrings are light and so much fun to wear!